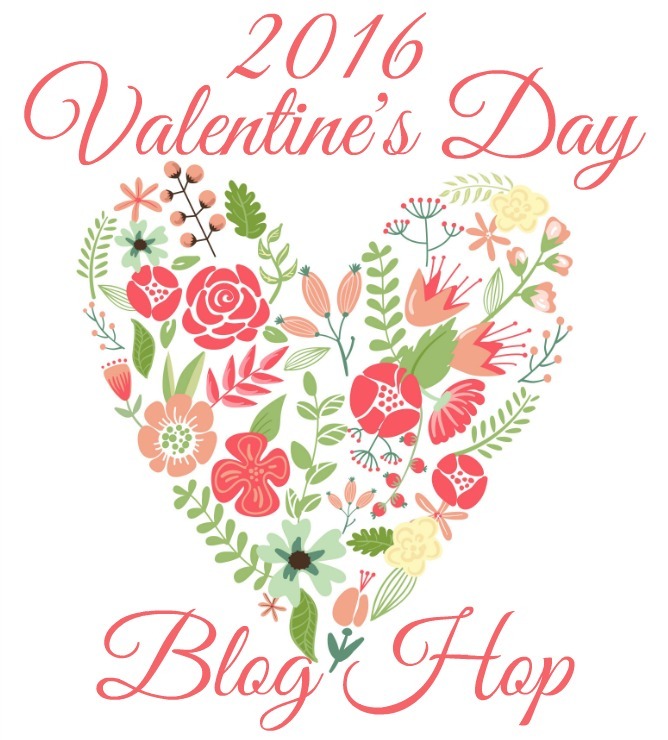 I am joining forces with several other bloggers to bring you some great projects in celebration of the Love month approaching. *This post contains some affiliate links for your convenience. Click here to read my full disclosure policy. Valentines’ Day inspired me to make this sign, however I plan to keep it out permanently all year round. I mean shouldn’t love be celebrated all the time :-). I love signs and this one is so simple to make. It only uses one 1x2x8 and some scrap pressed plywood. I always save my scrap wood pieces. Some might say I go a little overboard with saving scrap pieces but for projects like these scraps are so perfect. 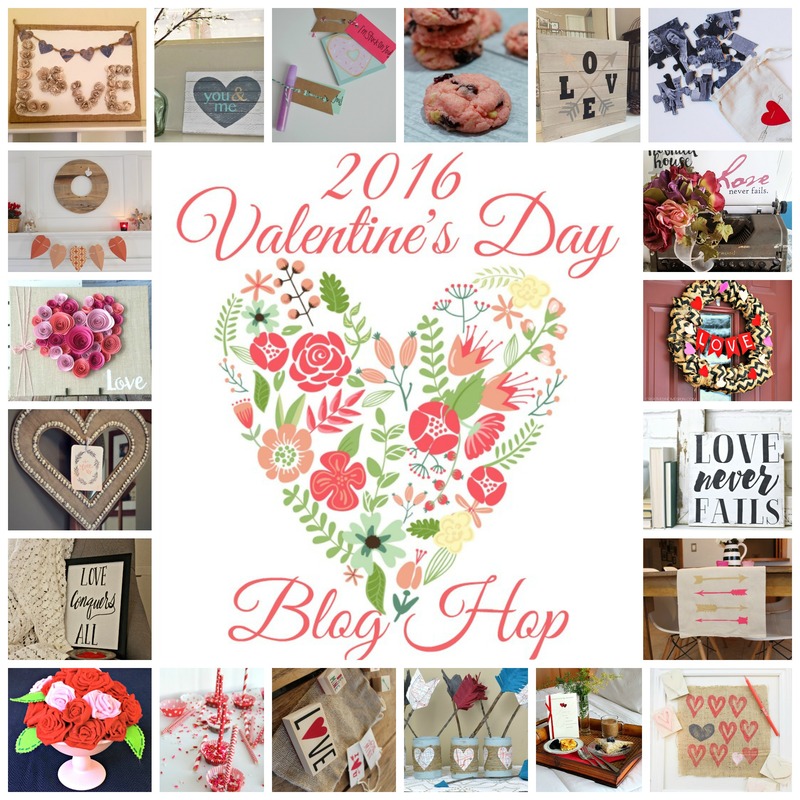 Check out what I made for Valentine’s Day, but please stick around to see what the other amazing bloggers did for Valentine’s Day. Step 1) I started out by lining up my 1×2 pieces and then turned them facedown. I used a square to help line up the pieces. I placed the three pieces of pressed plywood on the back of the six 1×2 pieces then glued and nailed them to the 1×2 pieces. Then I sanded any rough edges. Now I have a wood backdrop to design my sign. Step 2) I painted the wood backdrop with one coat of white chalk paint. Then to make the You & Me Heart design I used Word to create a heart template and played around with the font and placement to come up with my design. 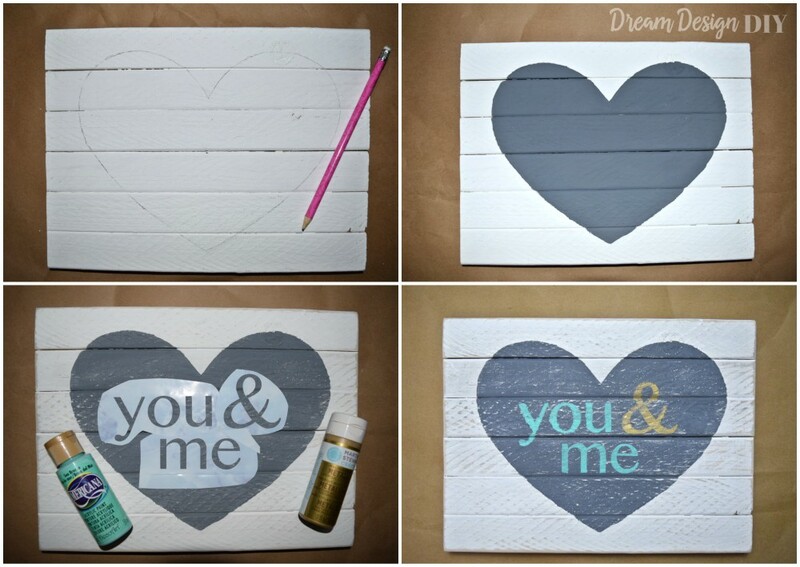 Step 3) I traced the heart on the wood backdrop and painted it with gray chalk paint that I made from a mixture of black and white chalk paint. 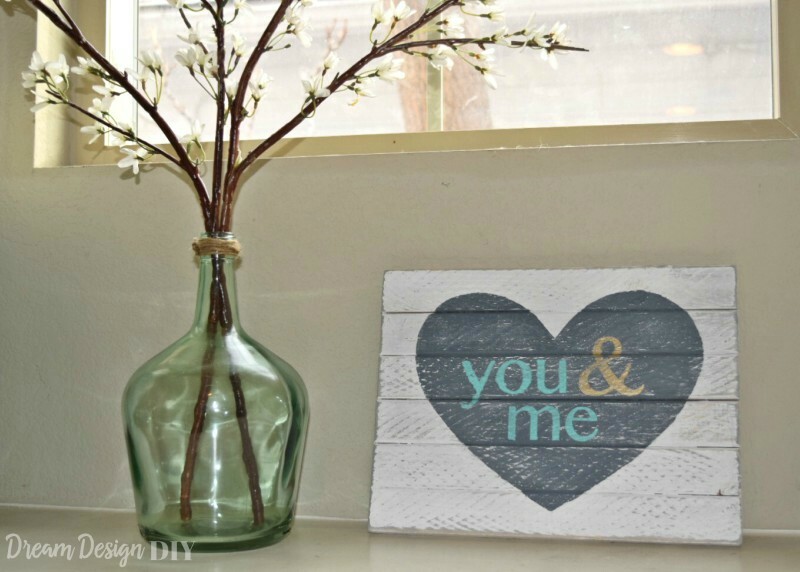 Then I created the words “You & Me” on my Silhouette Cameo and painted on my letters. I used paint colors Sea Breeze by Americana and Gold by Martha Stewart in metallics. Once the paint was dry I sanded the whole piece. Step 4) Finally I applied my 4:1 mixture of gray paint and water. I mix up the water/paint mixture then I paint it on and wipe it off. 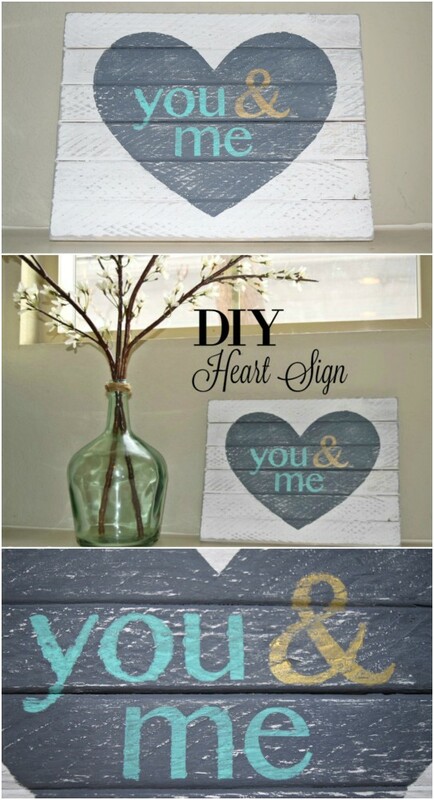 It is so perfect at picking up the sanded areas and creating a distressed look. Here are a few close ups to see the magic. Thanks for hanging out with me to check out my Valentine’s Project. Now stick around for a little longer grab some wine and chocolate and check out the projects of my blogging friends. Hey Tiffany – your sign is so adorable! We would leave it out all year round too! So happy to be sharing the hop with you! Cheers to a fabulous week. Thanks Vicki and Jennifer for stopping over from the blog hop! I just love this idea, Tiffany! Plus, it’s perfect year-round decor! Glad to be hopping with you today! Thanks Heather! I love signs maybe a little too much. This turned out really cute! I love that you can make custom stencils with a Cameo. Thanks Amy! I love my cameo and wanting to do so much more with it too. I love this sign! 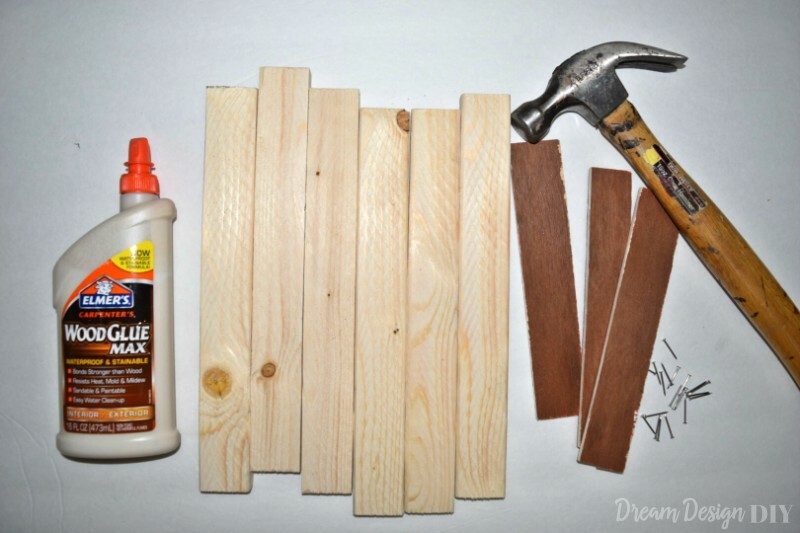 So great that you were able to use scrap wood! This sign is adorable, and I agree, you should totally keep it up all year! The colors you picked are perfect for Valentine’s Day, but also neutral enough to extend beyond the holiday. Love this Tiffany and am so glad to meet a fellow scrap wood hoarder! Please tell me I’m not the only one looking for a designated spot in the garage to keep it all.. Great sign, and I would absolutely leave it out year round. Happy Valentine’s Day! Yes Kim, there have been some marital stress about what to do with all the scrap wood. But I use it so often and it does deserve a spot in the garage. Thanks Ashley! Glad I was able to inspire. I love this sign……and the fact that you can leave it out all year is a bonus. Thanks for the tutorial. Pinning. Thanks Bonbon for stopping by! So pretty! And I love that you could keep this up year round! Thanks Amanda for checking it out! Thanks Tara, I know I never throw away any scraps they are so useful!